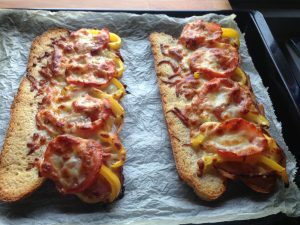 Are you in search of a perfect, crunchy, warm open sandwich? If yes, then you have come at the right place. 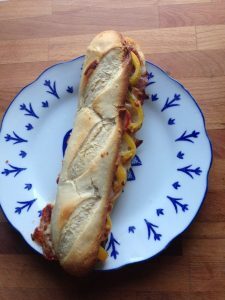 I have to say that sandwiches, piadina’s or pizza’s have become our traditional Sunday dinners. They are easy to make and just delicious. If I have not idea what to make for dinner they are like my secret weapon. Always hitting at the bulls eye! Since my boyfriend likes them a lot, I’m always in search for a new kind. 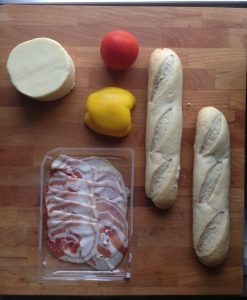 One new combination of ingredients, veggies or salami, mozzarella cheese and tomatoes… for me, only sky is the limit! Don’t you just feel you can smell this delicious pancetta even from the photo. 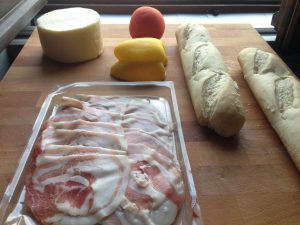 This soft, thin pancetta melts in owen the moment you put it in. What remains is the taste that fills you whole mouth. So, this is how I start. I cut through the bread and I apply super tiny amount of mayonnaise. 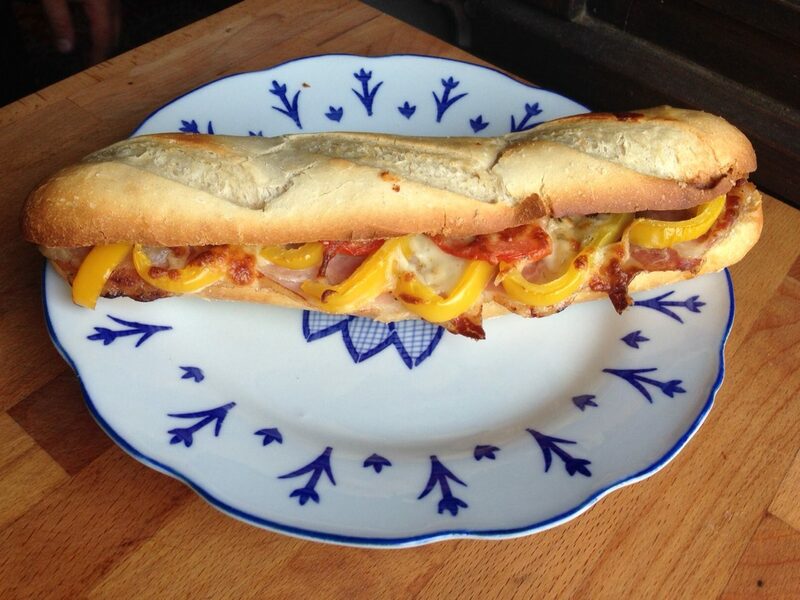 You don’t need much of it because of the pancetta and cheese, but enough to moist the bread. 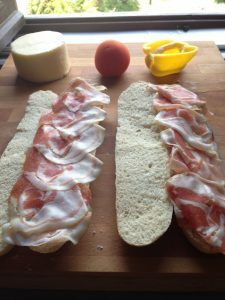 Then place pancetta in layers over the bread. I usually lay it one on top of the other covering half of the previous one. I use about 6 slices. Now its a time to slice yellow bell peppers. You can use any color. I just happen to have yellow one on hand. I slice them just perfect so that they would bake, but still remain crunchy. Line them up like a little soldiers. Once you are done with peppers slice the tomatoes. I like to slice it in circles. In that way once I close my sandwich they don’t slip out. I also get the moist inside remain in the sandwich. Place the tomatoes over the bell peppers and then sprinkle it with salt and dry oregano. You can also add black pepper of chilly pepper flakes if you have more a spicy kind of taste. My final touch is grated cheese. Now my sandwiches are ready for owen. 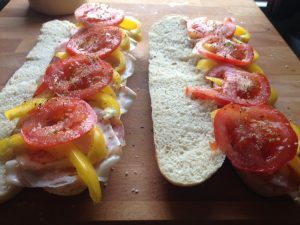 I bake my sandwiches for 12 minutes on 200 C.
Since this is half baked bread it needs that much time, but if you will try this recipe with full baked bread you can do 5 – 6 min. 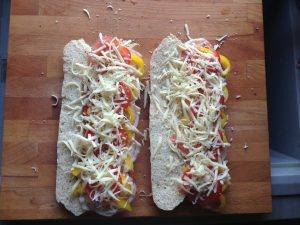 Keep your eye on the owen and once the cheese gets nice golden crust your Italian Open sandwich is ready. 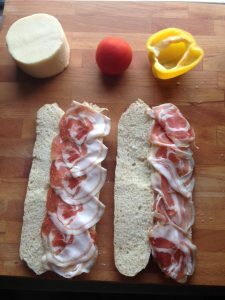 Did you know that in Italy we call sandwich PANINO, or in plural PANINI?! This is a simple work of art! 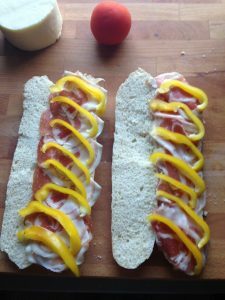 Let me know how what are your favorite ingredients for an open sandwich.